Where to Go and What to Do on Your Algarve Vacation! WHY GO ON AN ALGARVE VACATION? Sun, beaches, surfing and salty ocean waves (almost all year round). The Algarve is surrounded by warm water and gorgeous cliffs that rise out of the sand. On your Algarve vacation, you can take advantage here of good hiking and watersports galore. You’ll also find an amazing selection of boutique hotels! 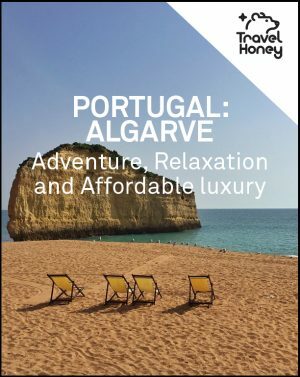 Check out the Travel Honey ALGARVE PHOTO GALLERY. View the PORTUGAL COUNTRY OVERVIEW for everything else. WHERE TO STAY ON YOUR ALGARVE VACATION? The Algarve is a region that runs across the south coast of Portugal. Central Algarve is the most developed. As you move to the west, the terrain gets more rugged. As you move east, the terrain is flatter and it’s less developed. You’ll also find the Ria Formosa Natural Park in the east, which is a protected system of barrier islands. If you want nightlife soon your Algarve vacation, head to Albufeira, Praia da Rocha or Lagos. If you go in the off-season (any time other than the summer), you’ll find great deals and the weather can be amazing all year round. Farmhouse of the Palms ($$$$) Chic, minimalist farmhouse with an ultra-stylish pool. Forte de sao Joao da Barra ($$$) Barefoot luxury retreat. Beach on one side and a pristine natural reserve on the other. Villa Monte Farm House ($$$) Design oriented hotel surrounded by an orange grove and two pools. Convento ($$) Romantic townhouse in an authentic fishing village for an unbelievable price. Quinta da Idalina ($$) Gorgeous views of the hills and ocean. Outside is painted white with bright splashes of blue. Amazing value to money and includes natural pool. WHERE TO EAT ON YOUR ALGARVE VACATION? Ocean ($$$$) Gorgeous, contemporary decor and two Michelin stars. On water’s edge. Rei das Praias ($$$) Eat on the beach and don’t forget to order rose. Best for fresh lobster and fish. This is a “see and be seen” place. Vila Joya Gourmet Restaurant ($$$) Sit outside and gaze at the ocean. Food is incredible, modern and delicate. Menu has options to satisfy everyone. O Estaminé ($$) Mouth watering seafood (clams, prawns, squid, fish) on an nature reserve just off the coast of Faro. Casa de Pasto Ze Leiteiro ($$) Fish with salad and potatoes. Tiny menu but exceptionally well executed. WHERE TO GO AT NIGHT IN THE ALGARVE? Heads up – some of the places get rowdy with tourists. We’ve listed the more mellow spots for your Algarve vacation. Canico Drinks, music and dancing on the beach. Bar is set above the beach between two cliffs. Stevie Rays Jazz Amazing mellow jazz tunes. Clube Praia Verde Dance the night with funky beats at this club. Duna Beach Club Lively and stylish bar by the pool and beach. BEST INSTAGRAM ACCOUNTS FOR THE ALGARVE? HOW TO GET TO THE ALGARVE? Faro airport is the only airport in Portugal’s southern region. Faro has flights from large European cities. If you’re coming from further away, Faro is only a 45 minute flight from Lisbon. If you’re driving, it’s just under 3 hours between Lisbon and most points on the southern coast. There is also a train service between Lisbon and Faro, about three hours and EUR 30 for a one way ticket. Check train schedules here. HOW TO GET AROUND ON YOUR ALGARVE VACATION? If you want to take advantage of hiking or a variety of beaches, renting a car is your best best in the Algarve. There is a public bus system but buses often run on limited schedules and remote areas are not well served. BEST ITINERARY FOR YOUR ALGARVE VACATION? 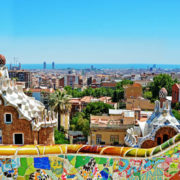 Check out these awesome itineraries from Travel Honey’s savvy traveler contributors. Don’t see an itinerary that matches your travel Algarve vacation needs? Let us know what you’re looking for by emailing support@travelhoney.com.